Jaybird, known for its line of headphones aimed at runners and fitness enthusiasts, recently introduced the RUN, its first wire-free headphones designed to compete with the wide range of wire-free headphones that are now on the market, like Apple's AirPods. I went hands-on with the RUN to see how they compare to the AirPods and other Jaybird products like the new Freedom 2 headphones, also announced at the same time. There's no denying the convenience of wire-free earbuds, but as I learned with the RUN, there are still kinks that need to be worked out with the technology. Design Like Apple's AirPods, Jaybird RUN headphones are separate standalone earbuds that have no wire connecting them to one another, for a freer, hassle-free listening experience. Design wise, the RUN headphones look more like the Bragi Dash than the AirPods, with an in-ear tip connected to a circular earbud that nestles into the outer part of the ear. A soft silicone tip fits over the speaker portion of the RUN, while a soft, highly flexible fin secures it in the ear. 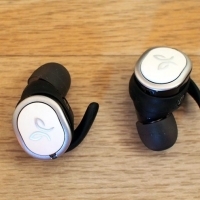 White aluminum-rimmed buttons are at the top of the earbuds, embossed with the Jaybird logo, and there are small green LEDs on each one that serve as indicator lights. The Jaybird RUN headphones are noticeably heavier and bulkier than the AirPods because all of the components sit in the ear without an elongated body. Size wise, they're a little over a half an inch at the thickest point, and depending on the structure of your ear, they can stick out a good bit. 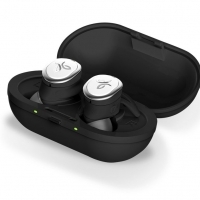 Logitech-owned Jaybird has been designing Bluetooth earbuds since 2007 and has established itself as a manufacturer known for creating quality headphones ideal for working out. 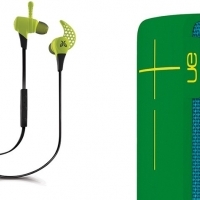 Jaybird's latest product, Freedom, is the culmination of years of design refinements. The Freedom Wireless Buds are Jaybird's smallest and most comfortable yet, with a sleek sweat-proof design, multipoint pairing, and up to eight hours of battery life. As with most products, there are some downsides, so make sure to read on to find out what to expect from Jaybird's latest product. Design and Fit Jaybird's Freedom Buds are tiny, a feat achieved by moving many of the audio components from the earbuds themselves to the remote control. Jaybird sells the Freedom in a range of colors from white and black to red and blue, with the earbuds themselves made from metal with plastic accents.